We spent our first day in Austin eating ridiculous savory-topped donuts, gallivanting around downtown Austin with our friend Shane (who was in town to give a talk at South by Southwest) and wrapped it up with the three of us back at our campsite drinking bourbon-lemonades, grilling burgers and corn and having our first Airstream slumber party. The next day, we took Shane to the airport to jet back to NYC. Our tummies were grumbling louder than the roar of the planes taking off; it was well past lunchtime and we were getting hangry. So we decided to made our way down to Lockhart, Texas: The Barbecue Capital of the World. 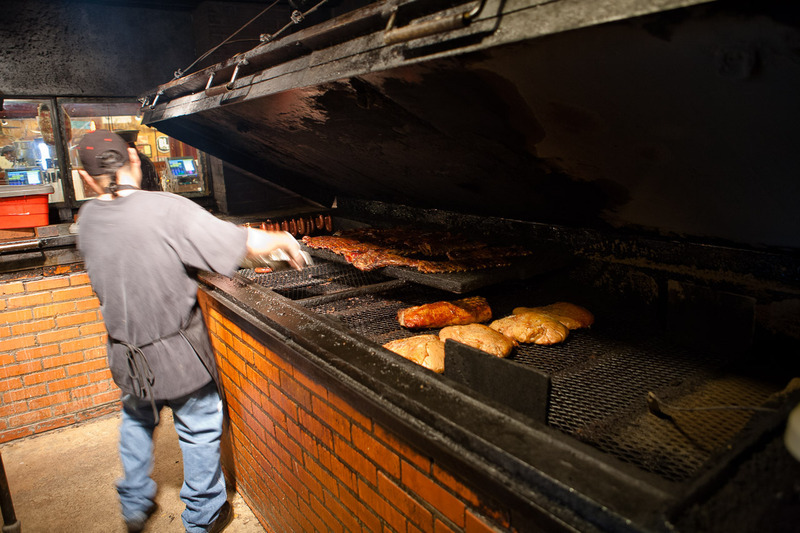 Just about 30 miles south of Austin, Lockhart is a little smidge of a town that happens to have the four best BBQ joints in Texas. 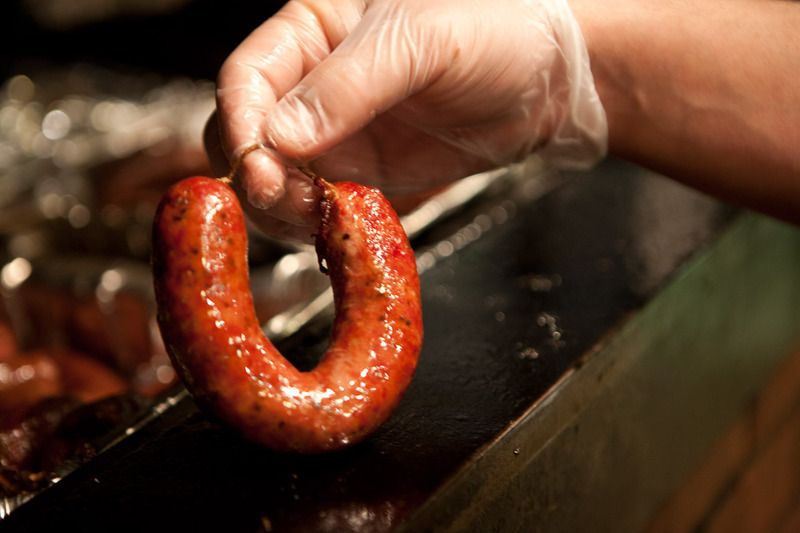 And everyone knows that Texas barbecue is the best barbecue (that's right Kansas City and South Carolina), giving Lockhart the right to claim having the best barbecue in the world. Apparently the way to go about it is to do a meat-tastic barbecue crawl and eat at every BBQ joint in Lockhart. We were not so brave (surprisingly, I know) so between Smitty's Market, Kreuz Market, Chisholm Trail and Black's Barbecue, we chose the last, thanks to a suggestion from Allison G.
Black's has been slow-smoking some fantastic classic Texas BBQ since 1932. Sides are self-serve, cafeteria style and you tell them what kind of meat you want and how many pounds. 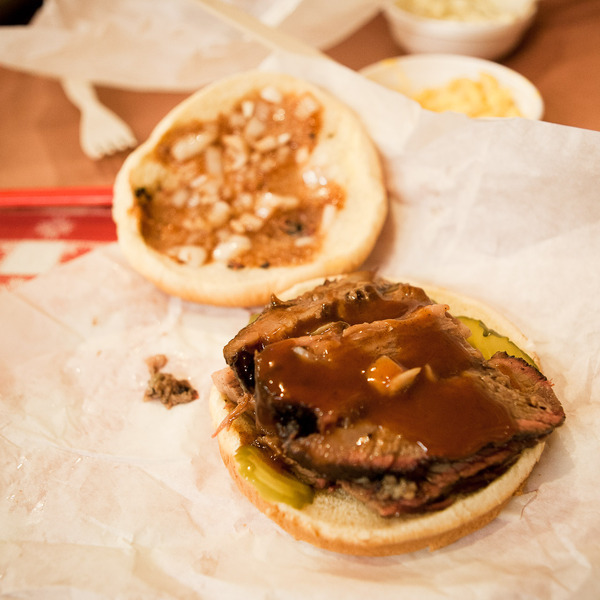 We went with the brisket, because you can't go wrong with brisket. They heave a huge charred slab of beef onto the chopping block that's nearly bowl-shaped from all the years of chopping and slicing barbecued meat. We got our brisket sandwiches, potato salad, mac and cheese and sweet tea and before we could head to a table to chow down, the barbecue man, noticing John's conspicuous Canon camera, asked him if he wanted to come around back and snap some photos of the smokers. Um yes, absolutely yes. 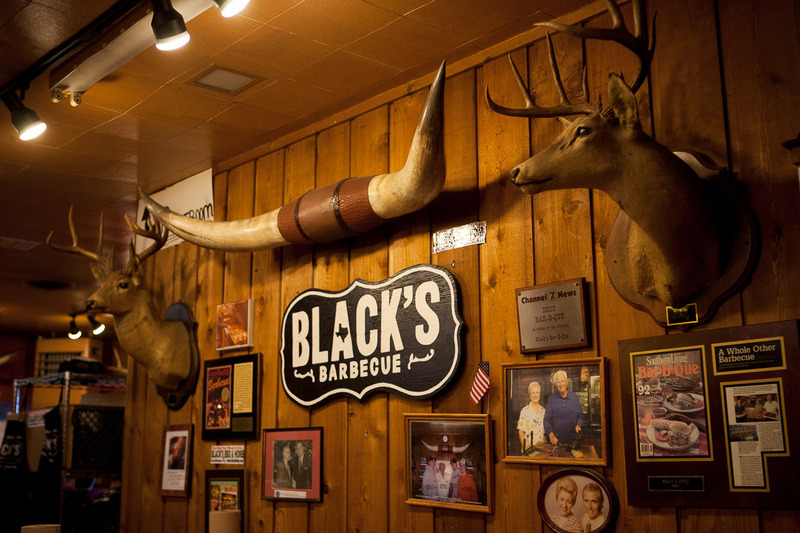 We found a booth in the dining area to scarf down our share of the world's best barbecue. The wood-paneled walls were lined with taxidermy deer heads, portraits of the owners from the 1960s and photographs of the Lockhart High School Football team that dated all the way back to 1906. The brisket was smoky and flavorful, with the perfect amount of char and fattiness and the BBQ sauce's tang offset the meats richness. Potato salad was classically delicious. 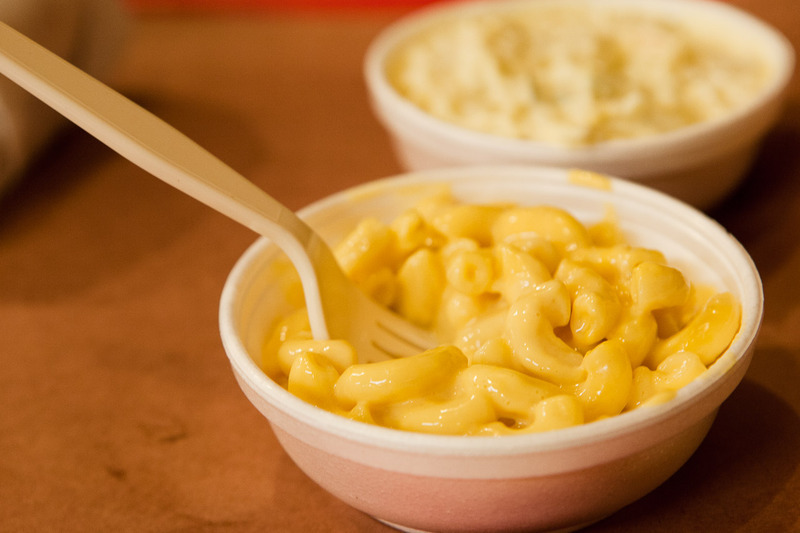 Oh so cheesy was the mac and cheese. The sweet tea was sweet as it gets. Pretty darn fantastic. 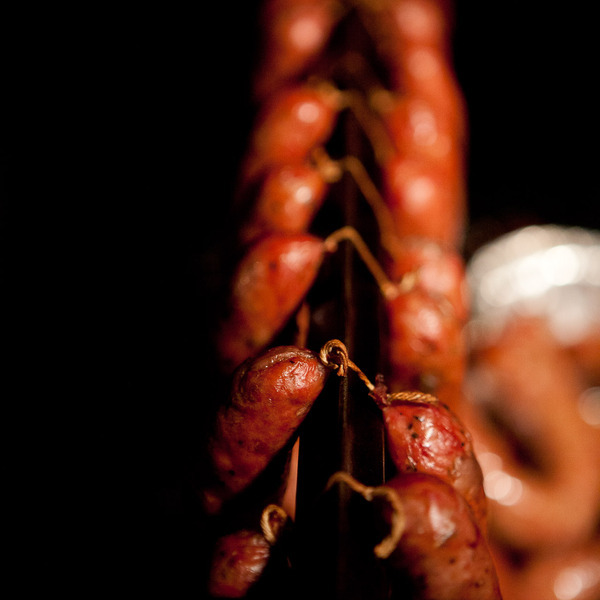 Once our plates were empty and fingers licked clean, John got the exclusive, behind-the-scenes tour where all the BBQ magic happens and got lots of great photos. We left to walk just a few blocks to the main square, where the architecturally stunning Caldwell County Courthouse stands, surrounded by more beautiful buildings dated to the turn-of-the-century that house barber shops, antique stores, and five-and-dimes. 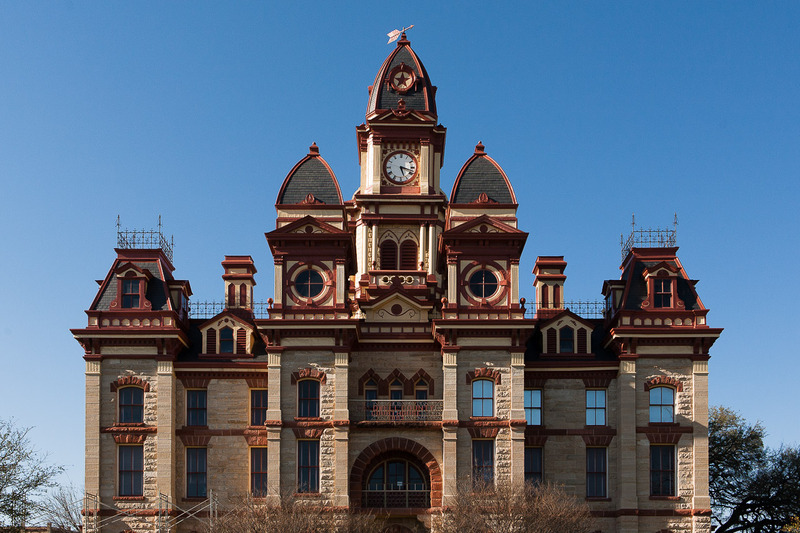 Lockhart, Texas is the quintessential small Texas town; charming, friendly and of an earlier time. Just so happens that they've got enough mouth-watering barbecue to earn the title of "The Best Barbecue in the World". Special thanks to allison g. (who suggested Eat more Texs BBQ) for making this blog post possible!